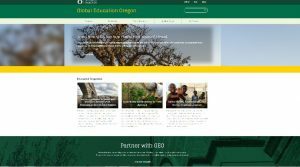 GEO’s website (geo.uoregon.edu) is getting some additional polish and functionality this fall! Some new content, search features and program details, as well as a shiny new look are expected to go live September 1st, so keep an eye on the site and be sure to request a walk-through from your institutional relations representative (IRR) when she visits! Most important, with this refresh, there are some changes in the links you may be using on your own website to direct students to scholarships and programs, so be sure to get those updated at your earliest convenience. Along with the website, there’s been more streamlining done for the application internal to GEO’s Studio Abroad system. You will be hearing from your institutional relations representative via email this week to request updates to your campus’ internal application instructions, so keep an eye out!